My second soap post was entitled “It’s Official, I’m Addicted!” No truer words have been written. Soap making is so addictive. At first, I liked it because I could make something that was useful without getting fat. But, as time goes on, that is not true any more. Well, it is not making me fat but how useful can all this soap be?? Maus and I would be washing 24 hours a day to keep up with my production. The soap in the top photo was my latest effort. Maus made me a new tall mould which I used but, when I cut the soap, I decided that the bars were too big so I cut them in half. They do look better. I also decided that the top halves look better vertical so that is how I photographed them. Every time I make soap, it is a huge learning experience. Firstly, I will have to rethink my mould. I don’t think people will want huge bars of soap. Secondly, I used Bramble Berry’s Lily of the Valley fragrance oil which caused me heart ache. I read as much as possible about it before I started – and it got fab reviews – but my soap overheated and the white section got glycerine rivers. They are no big deal but ……grrrh. I put the scrapings from my bowl into a small silicon mould and that did not get glycerine rivers. So… the lesson for the day was no more floral fragrances or, if I must use a floral fragrance, no titanium dioxide or, if I can’t resist using floral fragrances and titanium dioxide, then don’t insulate the soap – keep it cool!!! This is my cappuccino effort. There is no colour in the dark portion of the soap. The colour in the bottom layer is discolouration from Bramble Berry Turkish mocha fragrance oil. The second layer is, again, discolouration from the fragrance oil (I only put a little bit in that layer) and coffee beans. The top layer has no fragrance, only titanium dioxide to enhance the whiteness. I am amazed how dark the middle layer with the coffee grains is. There is also some morphing of the coffee colour into the white. The top is sprinkled with cocoa powder. I spoon-swirled the layers but I didn’t like it. You can just see the swirl between the first and the second layer in this photo. This bar is the end bar so it didn’t get much of a swirl and I like it the best. Lesson here: Next time, no swirl and, I will only have two layers: the dark and the white so it looks more like a real coffee. I think less white would look better and I may skip the coffee beans. I will decide on that after we try the soap. Finally, my honey and oatmeal soap. This one turned out exactly as I hoped. It is very exciting when that happens. This recipe actually includes honey and ground oatmeal. The honey comb top is from lining the soap mould with bubble wrap. It is a fabulous effect. Again, no colour was used in this soap. The colour (which is perfect for the theme of the soap) is discolouration from the fragrance oil (Bramble Berry Oatmeal Milk & Honey). No lessons here because everything went to plan. Yippee!!! This entry was posted in Soap making and tagged Bramble Berry Lili of the Valley fragrance oil, Bramble Berry Oatmeal Milk & Honey fragrance oil, Bramble Berry Turkish Mocha fragrance oil, Cappaccino cold process soap, Honey & oatmeal cold process soap by Glenda. Bookmark the permalink. Seriously Glenda you need to start an online business or eBay and sell these fantastic soaps before you and Maus wash yourselves raw! I love that you say ‘next time’ – you better start off loading that soap so there is a next time! They are all so different and they all look great! Very very clever. They are perfect. Hi Moya. I am far from a professional but I am having fun. Hi Maree, I am already thinking of making my own essential oils. Retirement is so much fun. Hi Kay. That is very interesting as I have bought 100 organza bags to put my soap in when I give them away. I will tell people of your trick. Thanks for passing it on. I love the honeycomb pattern – yet another use for bubble wrap and such a simple idea. I don’t use fragrance in my soaps, because I like the clean fresh smell just as it is, but had been toying with buying a couple to try out. Now thinking that perhaps I won’t bother as they seem to cause complications. Hi Anne. If you are thinking of buying Bramble Berry fragrance oils I have a list of the ones that are supposed to behalf and a chart showing discolouration (if any) of the top sellers. I could email it to you if you are interested. Thanks Glenda – if I decide to try some fragrances I’ll be in touch. Not sure if we get Bramble Berry over here though. I love all your soap and my Pete would love your first swirly soap. He is a hippy at heart. How did you think about using bubble wrap? When I hear things like this, I always wonder why I don’t think nifty thoughts like this. I love your soap! You have a real talent. Thanks Maureen, the bubble wrap idea was not mine. Someone more creative than me thought it up. I love reading these posts. 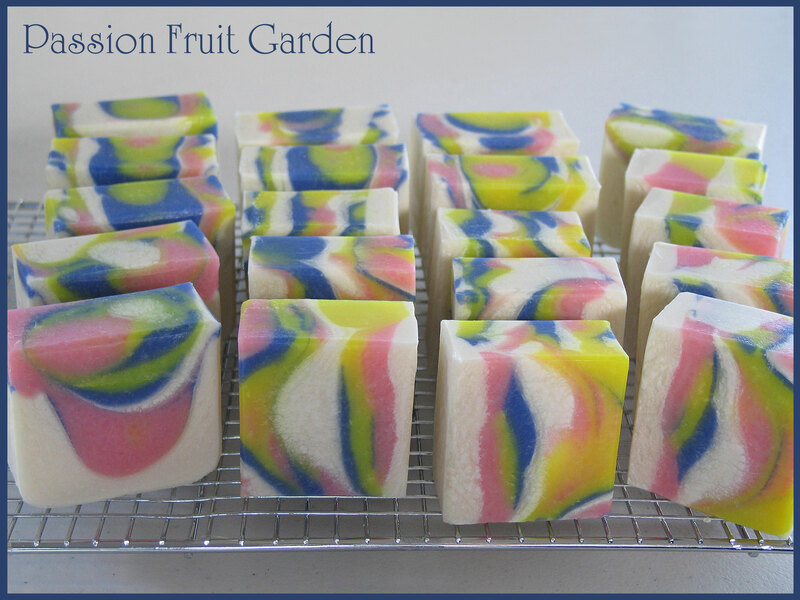 You are making some amazing soap. 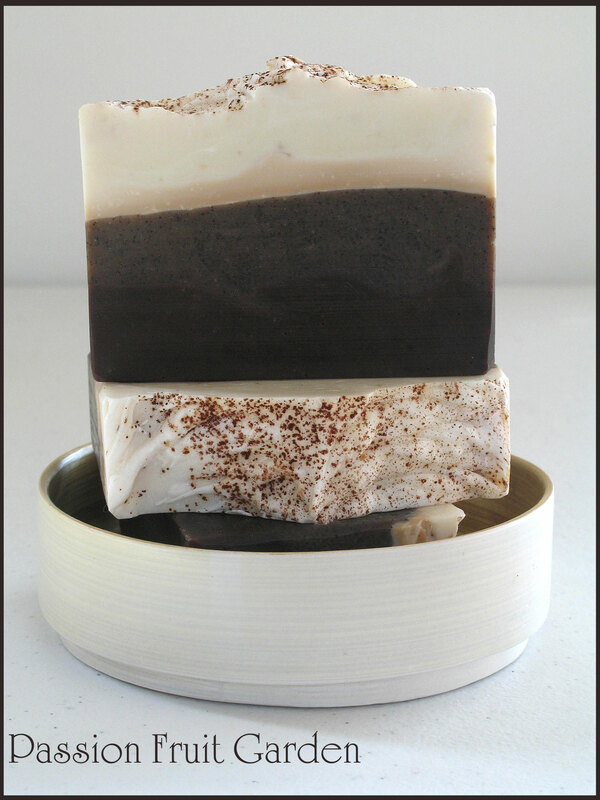 I do use ground coffee in one soap I make, but it is a kitchen soap as I find the grounds a bit scratchy for general use. Will be interested to see what you think. There used to be a forum that had reviews of all the soap scents from different companies. I can’t remember the name at the moment, but will let you know if I do. It was by soapers so they also write any problems with a scent they would post it. Look forward to seeing what you make next. My last soaping burst was a couple of years ago and I made enough soap to keep us going until now, even with giving loads away. However, I’ve assessed my supply, and it appears that I need to start soaping again. Expect to see something from me soon 🙂 It’s so addictive isn’t it. Two years Tania!! I feel better. Lucky Christmas is coming up! Can’t wait to see your soap. Thanks Karen. Every batch is a learning curve. 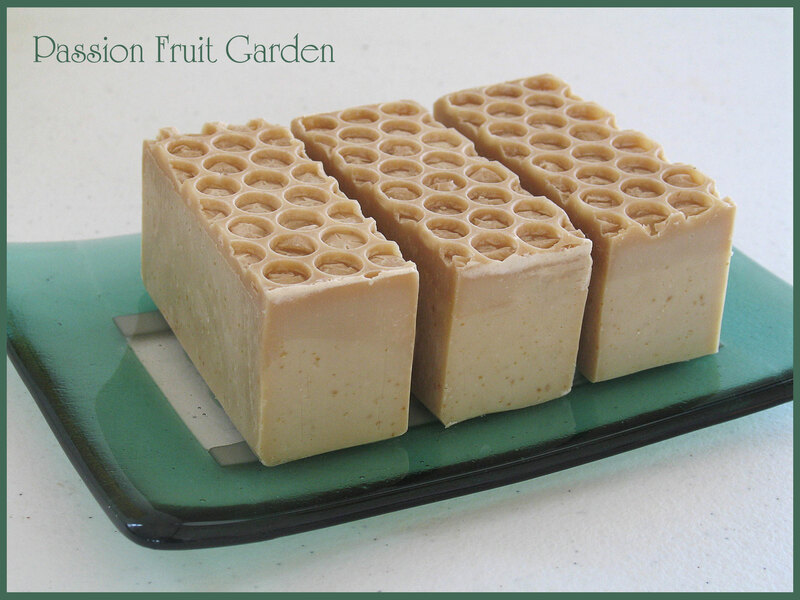 The honey & oatmeal soap looks perfect. You truly are addicted! Hi Carol, The bubble wrap impression really looks like honeycomb. I love it.